Notice it’s an adjective – meaning it describes something. That something would be whatever it is your getting ready to spew all over the place in the form of word, thought or action. Are we mindful of the things we say, do and think? I worry we are not. I believe we have hit a state of simply saying and doing whatever it is we’re thinking, come what may. Where did being mindful (which by the way, in my mind, goes hand in hand with being respectful) go? When did we become a society that simply does not care how our actions, thoughts, and deeds affect others, whether known to us or not? Oh I’m certainly not saying EVERYONE is guilty, certainly not. There are those of us left who guard our thoughts, deeds and words in order to show respect. There is a fine line between being mindful and simply holding things inside for the sake of keeping the peace. There are times when this is appropriate and times when it isn’t. 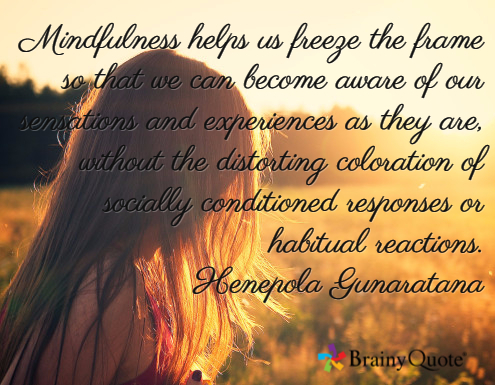 Being mindful means we take the time to collect our thoughts before we go blurting things out that could cause harm. Being mindful means we take the time to gather ourselves before we take action. Being mindful means we take the time to think before we allow our thoughts to travel down a wrong path. In a society where anything goes, everything is going — in the wrong direction! And that’s my one minute mind! Nice words. I think social media has had a negative impact on the mindfulness of people. People interact with screens all day and blurt out any old thing that comes to mind in 140 characters or a quick FB post. Doesn’t encourage or teach being mindful. I think you’re right Nicole. Oh Lottie, I’m so glad you liked it and a mindfulness course sounds fab!! I was just reflecting on this, myself. Great post. I agree that we have left mindfulness, manners, and respect in the dust. WE could all use a gentle reminder like this post. Thank you!